Kodular Starter is a program that creates a server on your machine that is used by the Companion to transfer data (e.g. blocks) between the Creator and your test device. You can check Kodular Starter status here. Kodular Companion is an app to test changes in your Kodular App Project, in real time. It can be highly valuable for prototyping, especially while building user interfaces. 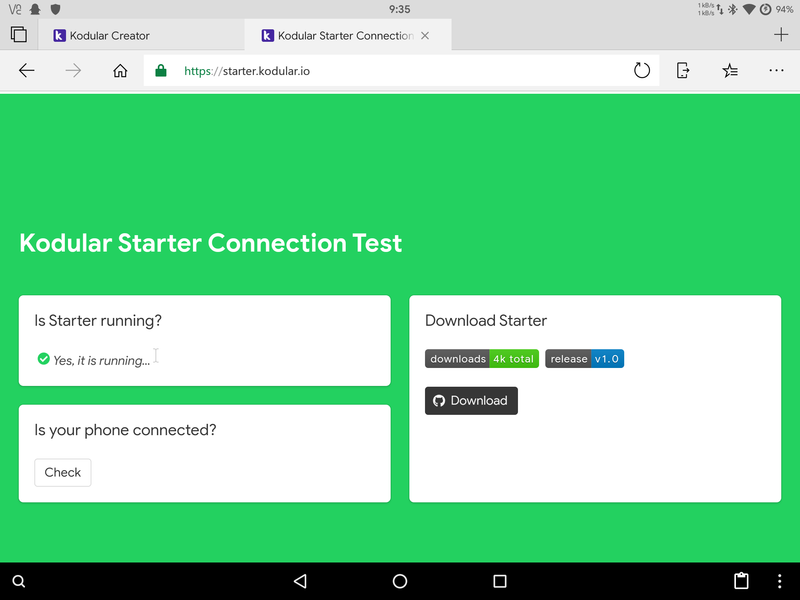 The app can connect to the Creator (TEST > Companion) once the Starter is running. Note: All features might not work equally well on the Companion. It is advisable to compile an APK (EXPORT > Generate QR code for app or EXPORT > Save .apk to my computer) for thorough testing. Some components only work on compiled APKs, while some work differently for the Companion or the APK. The Companion can be installed on Android devices from here. How to use the Companion with the Creator running on a Linux host? Process: In this guide we’ll be storing the Starter in ~/Kodular/, but any folder will do. That’s it! You can now use the Kodular Companion for real-time testing. Phone connected and i can use starter now. This is a guide for Linux. Maybe you can make one for Mac? I know this is for linux. And I asked about mac version. When it will release or any news about mac version. Got it? Thanks. I am going to try now and i will inform you. Tested to be working with full functionality on my portable setup. Fairly amazing, because it is an Android tablet. For someone who has problems with it, do not forget to install adb, the starter needs that! Not required for wireless connection via the Companion. i am new to this installation process on linux, i have Manjaro version of linux and i dont know how to find the packages to install. @Kanishka_Developer can you please help me to install this. Manjaro doesn’t have apt as its Package Manager. You should install Muon or Synaptic Package Manager from the app store on Manjaro, and then use that to get the packages (I recommend that since both Muon and Synaptic provide a great GUI and search function for managing packages).